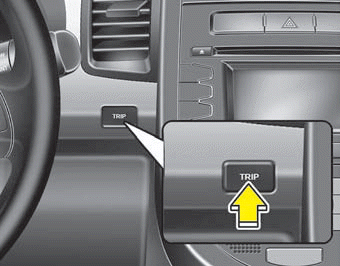 The trip computer is a microcomputer- controlled driver information system that displays information related to driving on the display when the ignition switch is in the ON position. All stored driving information (except distance to empty) is reset if the battery is disconnected. 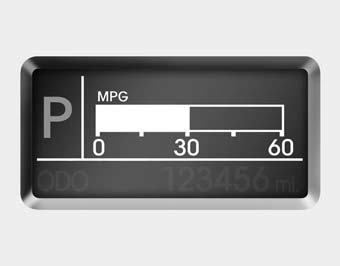 The meter's working range is from 0.0 to 999.9 miles. 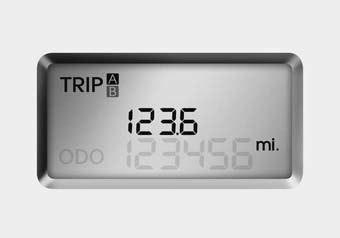 Pressing the TRIP button for more than 1 second, when the tripmeter is being displayed, clears the tripmeter to zero (0.0). 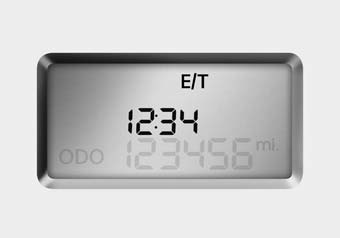 This mode indicates the estimated distance to empty based on the current fuel in the fuel tank and the amount of fuel delivered to the engine. When the remaining distance is below 30 miles, “---” will be displayed and the distance to empty indicator will blink. 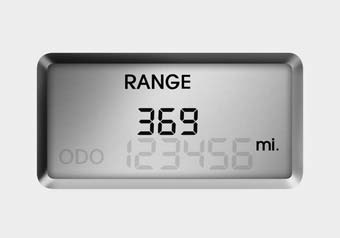 The meter’s working range is from 30 to 1500 miles. 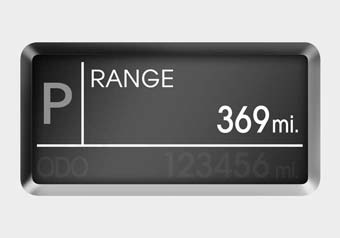 If the vehicle is not on level ground or the battery power has been interrupted, the “Distance to empty” function may not operate correctly. The trip computer may not register additional fuel if less than 6 liters (1.6 gallons) of fuel are added to the vehicle. 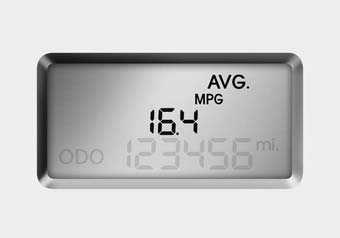 This mode calculates the average fuel consumption from the total fuel used and the distance since the last average consumption reset. 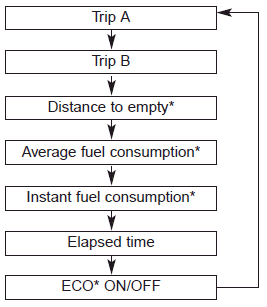 The total fuel used is calculated from the fuel consumption input. For an accurate calculation, drive more than 0.03 miles (50 m). 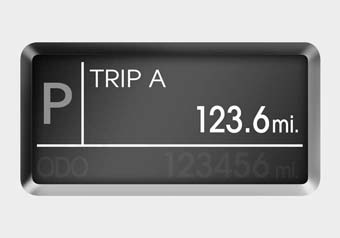 Pressing the TRIP button for more than 1 second, when the average fuel consumption is being displayed, clears the average fuel consumption to zero (--.-). 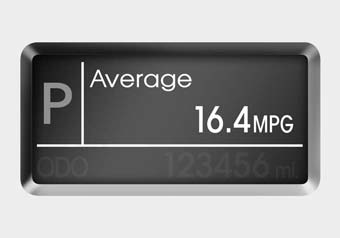 If the vehicle speed exceeds 1.6 MPH (1km/h) after being refueled with more than 1.6 gallons (6 l), the average fuel economy will be cleared to zero (----). This mode calculates the instant fuel consumption during the last few seconds. Even if the vehicle is not in motion, the driving time keeps going while the engine is running. The meter’s working range is from 00:00~99:59. 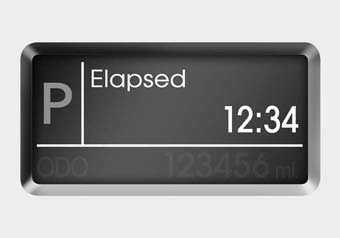 Pressing the TRIP button for more than 1 second, when the driving time is being displayed, clears the driving time to zero (00:00). You can turn the shift indicator on/off on the instrument cluster in this mode. 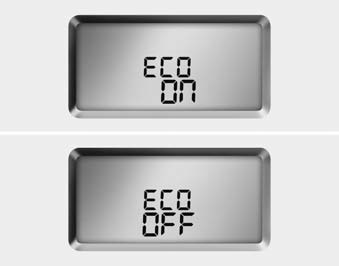 If you push the TRIP button for more than 1 second in the ECO ON mode, ECO OFF is displayed in the screen and the shift indicator turns off. 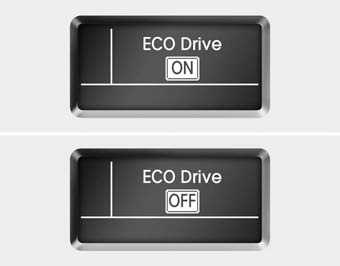 If you want to display the shift indicator again, press the TRIP button for more than 1 second in the ECO OFF mode and then ECO ON mode is displayed in the screen.